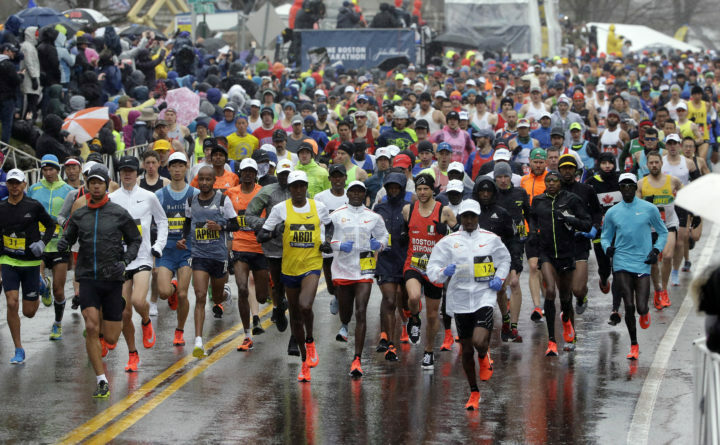 The field of men's elite runners leave the starting line in the 122nd Boston Marathon in Hopkinton, Massachusetts, April 16, 2018. To consult an almanac is one way to appreciate the magnitude of Ben Beach’s record streak of completing 51 consecutive Boston Marathons. Beach ran his first Boston Marathon at 18 in 1968, before the moon walk, Watergate and the fall of the Soviet Union. Beach, from Bethesda, Maryland, will start Monday’s Boston Marathon and attempt to extend his record to 52. He has run with task-specific dystonia since 2002, when he was merely 34 years into his streak and tracking but always one year behind Pennsylvanian Neil Weygandt. Running used to be less fraught for Beach, who ran his Boston personal best of 2 hours, 27 minutes, 26 seconds in 1981. In last year’s cold, wind and rain, Beach struggled to the finish in 5:46:59. Even while extending his record, the 26.2-mile distance these days is hardly the leader’s stroll up the 18th fairway at Augusta but more like an up and out of the trenches into no man’s land. Bain has been a prolific and talented local runner but now with three young kids and at age 41, his annual running focus is Boston. “I don’t know when [my streak] became a thing, but I just love everything about the race.” While Bain still runs well under Boston qualifying times — he finished in 2:42:56 two years ago — he is still three years away from Boston’s Quarter-Century Club and the relaxed qualifying time of six hours. Beach’s longtime friend, training partner and Cherry Blossom race director Phil Stewart labeled Beach’s annual Boston trek “Ben’s Burden” long before Beach owned the record. In a strange coincidence, Stewart, too, developed dystonia; although Stewart’s is less disruptive, both have received treatment at the National Institutes of Health. Beach and Stewart ran Boston together in 2013. That may be. But with the streak record his own — and growing more Ripkenesque each year — Beach has within his sights a new and greater goal: the record of 58 Boston finishes, held by marathon legend Johnny Kelley. Tail wind or cold and stormy, running with the elites or just beating the cutoff time, count on Beach, left leg flailing, to finish. Because for Beach, it’s always spring and a good day to run, with cherry blossoms along the Potomac and the magnolia trees on Commonwealth Avenue perpetually in bloom.